Will Google Ever Stop Changing Its Algorithms? In the business world, heuristic dictates that tried and true methods will win over others most of the times. Companies usually stick to their modus operandi, and only rarely change it when they're certain it's gonna be a win win. But this doesn't mean that they don't take risks. Most companies take them. But some take them more often than others. Look at Google, for example. They're changing things dazzlingly fast, not caring whether webmasters like it or not. Will Google ever stop changing so much in its search results? The thing about the web is, it is forever changing. It isn't what it used to be 5-10 years ago, and it definitely won't be the same as today after half a decade more. Things change. Technologies change. The things that users need change. And the things that Google thinks that they need to do for users will always be changing. So it is never a question of what is to come next, but when. And then ofcourse, spammers and their techniques are always changing. People used to buy links and clicks on their sites to generate traffic and earn an income. That stopped, but some malicious SEOs started using black-hat techniques to again rank well in search results. These methods will forever keep on evolving, and so Google is always looking for different new ways to try to rank search results better, and cleanse them of spam. The result is ever-changing flux! There will always be change going on in search results. If you've got a good search result, you can count on the fact that it's going to adapt based on what the users are looking for. For example, people have now started to do more spoken-word or conversational queries, which is what Google's Hummingbird update was all about! 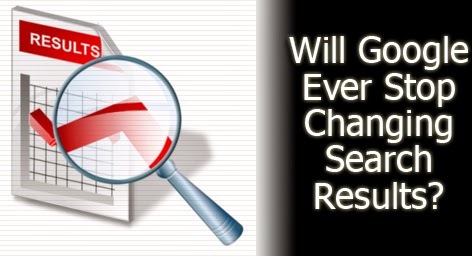 How Google Changed SEO in 2013? Processing such queries is not easy, and it requires constant effort on the search engine's part to try and understand more of such queries. And even if a search engine could do a perfect job on all the queries today, people will ask even harder questions tomorrow. So Google (or any other search engine for that matter) has to be ready for that. It has to return answers that people are looking for, and be able to say: "Oh, this is what this person's talking about." So we can expect that things are going to keep changing for the foreseeable future. SEO in many ways is about change, and the ability to adapt, and evolve and return better and better resources for users, and it's just going to be that way on the search engine side of things for the foreseeable future.